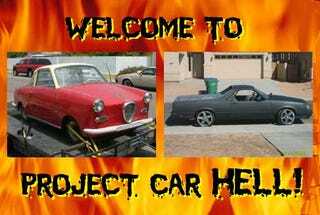 Project Car Hell: Goggomobil Or Grand Nationalmino? In our Star-Spangled Project Car Hell Edition last Friday, the Rambler American (OK, fine, it's actually a Rambler Six) outpolled the Austin America by a 60:40 ratio. Was it a case of rust triumphing over Joe Lucas, or the patriotic appeal of wholesome, corn-fed Kenosha over the sinister English town of Longbridge. Today we've decided to ditch the common-theme idea and grab two totally different- yet oddly compelling- Hell Projects for your purgatorial pleasure. PCH, Red, White, And Blue Flames Edition: Austin America Or Rambler American? After you see an ad like this, how can you resist the Goggomobil? Goggo! Goggo! Every day, you look at your Goggo-free garage and sigh wistfully (but secretly feel relieved that it's impossible to find a Goggomobil project). But wait! What have we here? Yes, it's a genuine 1966 Goggomobil TS 250, available for under four grand! Now you can have your own tiny German two-stroker, and all you need to do is finish the "necessary COMPLETE RESTAURATION" the seller had planned to do when he or she bought it. Don't worry about hard-to-find parts, because the seller says "As far as I can tell it's COMPLETE - ALL the parts for completion seem to be there including a complete owners/shop manual in German." See, everything you need, though the disclaimers "as far as I can tell" and "seems to be there" might cause a tiny bit of trepidation in the hearts of our more suspicious readers. There's rust. The engine "turns freely" (possibly because all the rods are lying in a heap in the oil pan). How hard could it be? Thanks to UDMAN and Mad_Science for the tip! Come on, a 250cc engine? That's hella small! You need more than 15 ponies moving your ride these days, and you also need a truck bed! Obviously, the El Camino is the cartruck for a discerning sophisticate such as yourself, but where's the hell? El Caminos are easy projects! But hold on there- what if you were to drop the drivetrain of a Buick Grand National into a G-body El Camino? No, wait- what if you were to graft the front bodywork and interior from a Grand National onto that El Camino, then add boost until the transmission begs for mercy? Why, then you'd have something much like this 1979 El Camino with 87 Turbo Buick Everything, that's what! In one of our all-time favorite pieces of car-ad description, the seller estimates that this project is 87% COMPLETE. Not 84%, mind you, or even 88%. The engine came out of an alleged 10-second Grand National, runs on race gas only, and has already fried the unnamed automatic transmission (which "NEEDS WORK"). Also unnamed is the "bulletproof" posi rearend, which we sure hope is at least a GM 12-bolt. The line "FUEL LINE busted and i took front bumper off to try to fit a front mount intercooler (was not sucsesfull)." is somewhat disconcerting, but no doubt you'll unravel that mystery and oh-so-many others with this project. Then you'll be King of the Hoons!